Discovery Point is a world-class tourist attraction centred around the famous research sailing ship RRS Discovery, which carried the intrepid explorers Scott and Shackleton to the Antarctic. There is also a cafe serving snacks and hot meals throughout the day, and a gift shop which offers exclusive Discovery Point items, and other nautically themed and Scottish gifts. 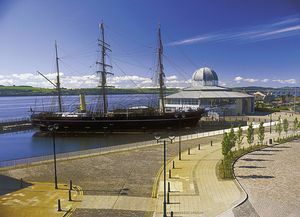 The interactive displays in the museum tell the story of the RRS Discovery - from its launch in Dundee in 1901, through three voyages to Antarctica, to its restoration and return home to Dundee in 1986. There are themed cinema sections where the different aspects of the story of Discovery are told. In one of the sections, about Captain Scott's voyage to the Antarctic, the audience can sit on moveable lit-up "ice cube" stools, which the kids will enjoy! Many of the actual artefacts that were taken on the RSS Discovery are displayed in the Museum. The scientific instruments the crew used to study the Antarctic, the protective clothing they wore (basic compared to today's winter clothing!) and the tools and supplies they needed to survive all make fascinating exhibits. There are working models that kids (and adults) can try, to find out how things worked aboard RRS Discovery. These include a model of the winch used to load the ship, and a harness that allows you to see how much effort is required to pull a sledge across the Antarctic snow. We really enjoyed this part of Discovery Point - there was a lot more in the museum than we were expecting, and it’s displayed in an informative and engaging way. After thoroughly exploring the Museum we were ready to see the star of the show - Captain Scott's ship Discovery! You board the Discovery (which is actually in a dry dock so you won't feel the boat moving!) via a narrow walkway, which takes you straight onto the main deck. You have great close-up views of the masts and rigging, and the funnel, which is hinged so it could be folded down out of the way when the main sail was in use. There are two steering wheels - one at the front and one at the back, giving lots of opportunities for photos of you pretending to steer the ship! You can climb up onto the main bridge near the front, and walk right to the back of the ship, where you can see down to the rudder through a specially made viewing hole. There are also really good views of the new V&A Museum next door, which is itself shaped like a boat. There are no portholes on Discovery, as they would mean that the ship would not be strong enough to withstand the pressure of the pack ice in the Antarctic. Instead brass mushrooms were installed into the decks to allow light and ventilation below-deck. You'll see them dotted around everywhere as you walk above-deck. The narrow entrance to allow you to view RRS Discovery inside leads you straight down into the area where the coal powered engine used to be. The engine is no longer there (it was scrapped in World War 2 when the metal was need for the war effort), but there are models showing what the conditions were like for the crew who tended the engine. After the engine room and coal bunkers you pass by the Bosun's Store. It is full of the tools and supplies the crew used to maintain the ship on their long voyage. They had to be completely self-sufficient - if they didn't have the correct tool to fix something on the ship, they had to make it! Then you walk through the galley, where the evening meal is being prepared (by mannequins! ), and glimpse inside the sick bay. The sick bay was placed next to the galley as it was the warmest place on the ship. You get a real sense of what felt like to be a crew-member on Discovery when you visit the mess deck, with hammocks and every-day belongings crammed into the small room. You can contrast this with the elegance of the Wardroom, where the officers lived. Each officer had a cabin with wooden fixtures and brass fittings. The surroundings may have been more luxurious, but it was the coldest part of the ship, with ice forming on the walls at night! There are displays of personal items and scientific equipment in all of the rooms below deck, giving you a really good idea of what it was like to live and work in the cramped conditions as one of the 48 crew members on Discovery. Commissioned by the British National Antarctic Expedition, RRS Discovery was the first ever ship specifically designed and built as a Scientific Research Ship. Her design was based on the whaling boats that regularly navigated the rough seas of the Arctic and were strong enough to withstand the pressures of pack ice. 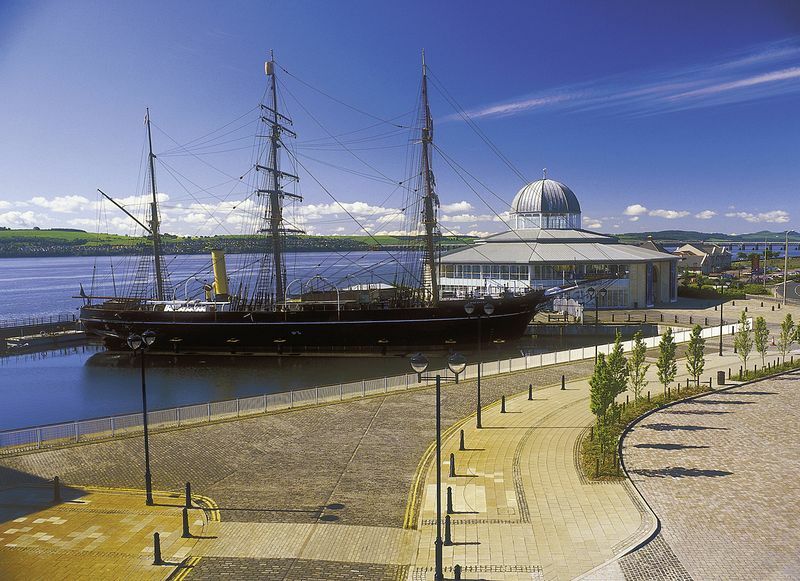 RRS Discovery was built in Dundee, by the Dundee Shipbuilder's Company and was launched on the 21st March 1901 into the Firth of Tay. The main purpose of the first expedition by RRS Discovery was in fact to carry out scientific research, and not to reach the South Pole. 48 men - a mixture of scientists, naval seamen and merchant seamen - set off from the Isle of Wight in August 1901, and reached Antarctica in January 1902. Discovery was trapped in the pack ice whilst the scientists studied the meteorology, oceanography, geology and biology of the Antarctic for two years. They hauled sledges across the snow in temperatures as low as -45 degrees. When it was time to return to Britain, there were over 20 miles of pack ice cutting Discovery off from the open sea! In February 1904 the sailors used controlled explosions to free Discovery from the ice so that she could return home. RRS Discovery reached Britain on 10th September 1904 - Captain Scott was a National Hero and was given many awards. The research and discoveries that resulted from this expedition were extraordinary - over 500 new marine animals were discovered, and once the research was published, it occupied ten large volumes! RRS Discovery was used for many different things after her epic maiden voyage. She was used as a cargo ship by the Hudson Bay Company, and took munitions to Russia during World War 1. She did in fact return to the Antarctic twice more - once to track whales in 1925, and then to chart and claim new lands for Britain in the B.A.N.Z.A.R expedition in 1929. Discovery was later laid up in London where she became disused and dilapidated, and in 1979 The Maritime Trust started her restoration with a grant of half a million pounds. The Dundee Heritage Trust took over Discovery in 1986, and she was moved to her current berth at Victoria Dock. The Discovery Point Visitor Centre was built alongside her, and she is now a 5-star visitor attraction. Discovery Point is a great place to visit with all of the family, young and old. With many interactive displays and videos, the younger members will be fascinated, especially with the opportunity to explore the ship. Three generations of our family enjoyed a great afternoon out when we visited. Even if a member of your party can't get on board the ship (there are narrow passageways and steep stairs), there is a special display on the quayside (undercover so you can use it in the rain) that shows a film of the ship both above and below decks, so they don't need to miss out! Closed: Christmas 25th - 26th December, and New Year 1st January. Please call for details of group rates. Save with a Joint ticket with Verdant Works. Opposite Dundee railway station, 10 mins from Dundee bus station - located just by the River Tay. RRS Discovery Parking: There is a short-stay pay and display car park next to Discovery Point, and longer term parking in the multi-storey car park at Greenside, or the car parks in Gellatly Street or Olympia.